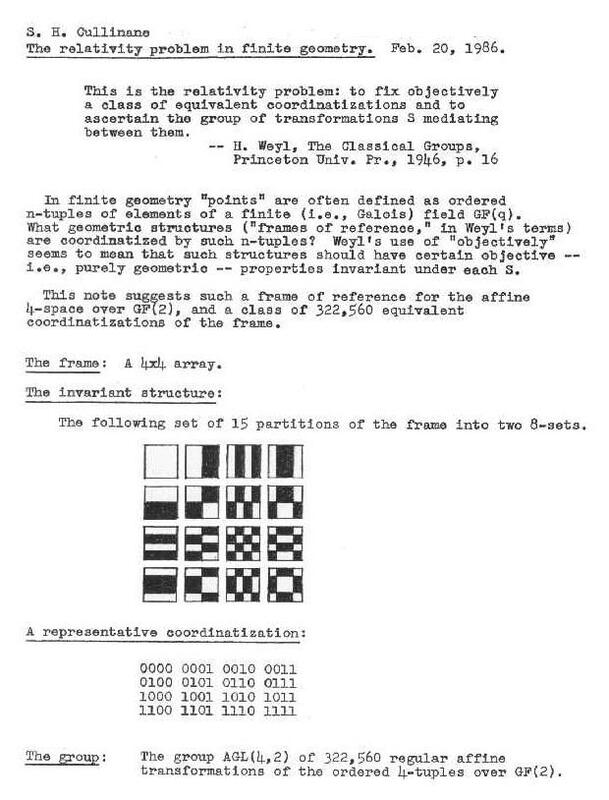 PG(3,2) that apparently first appeared (presented as such*) in . 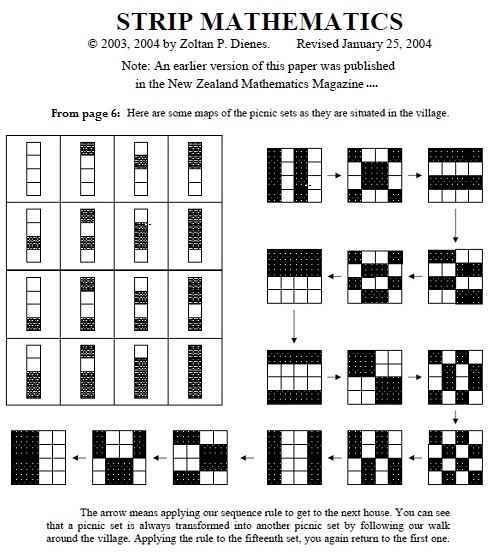 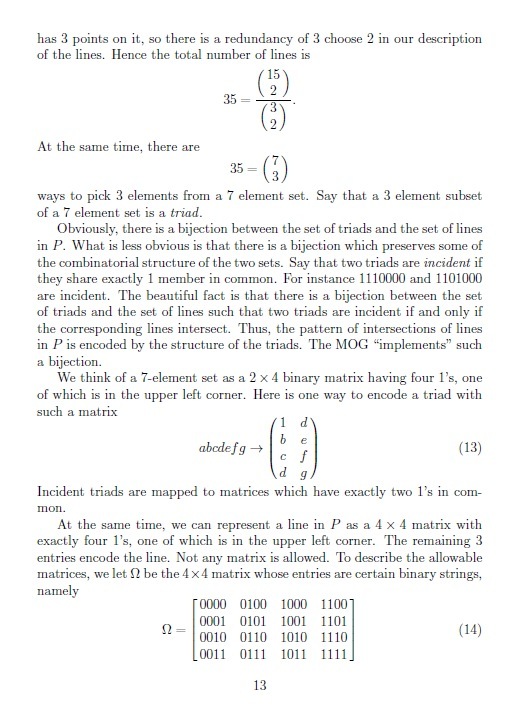 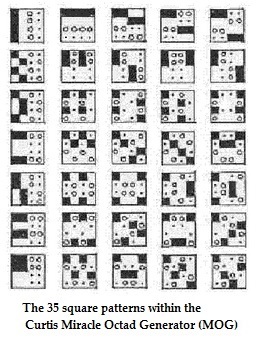 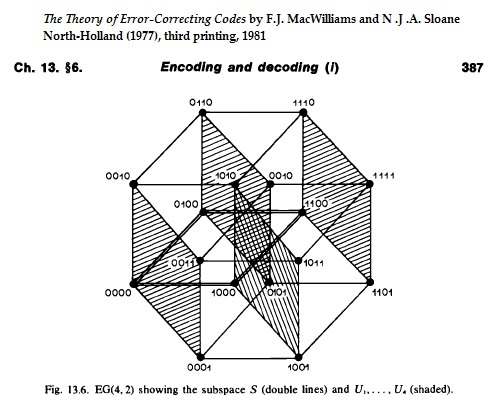 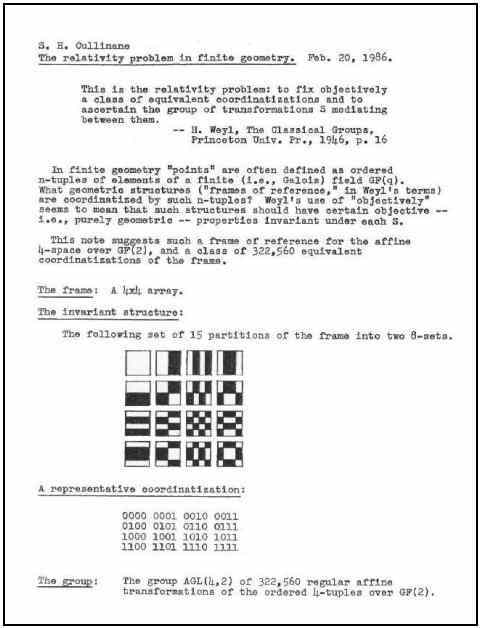 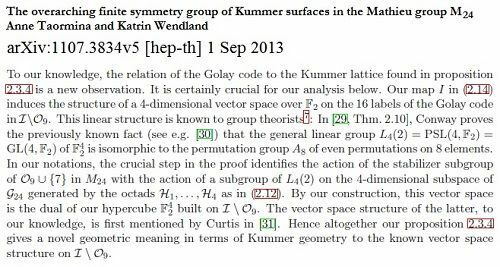 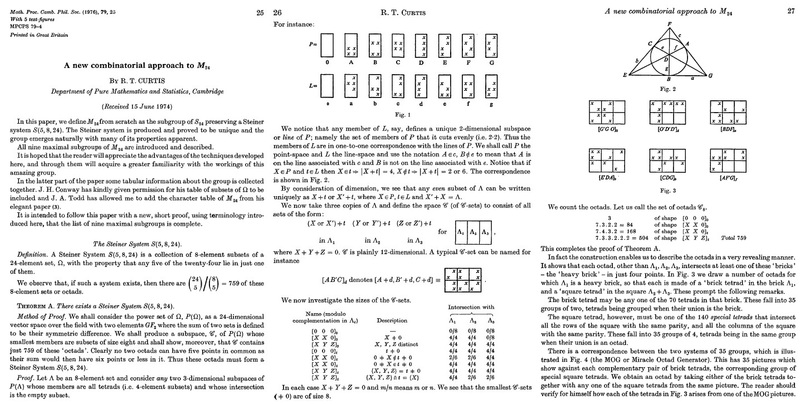 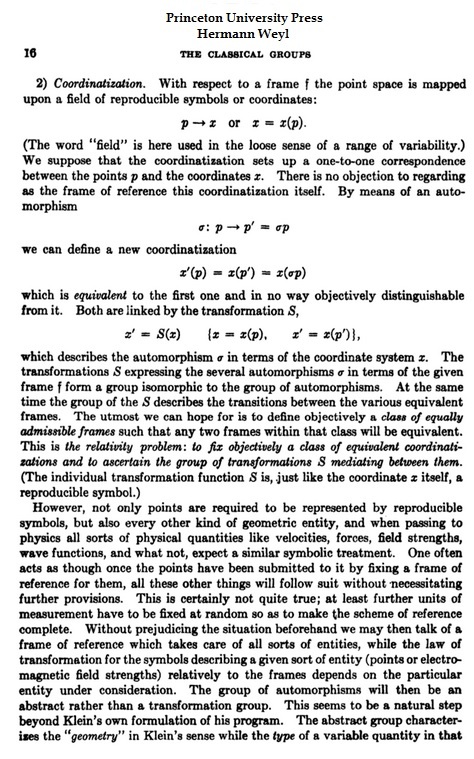 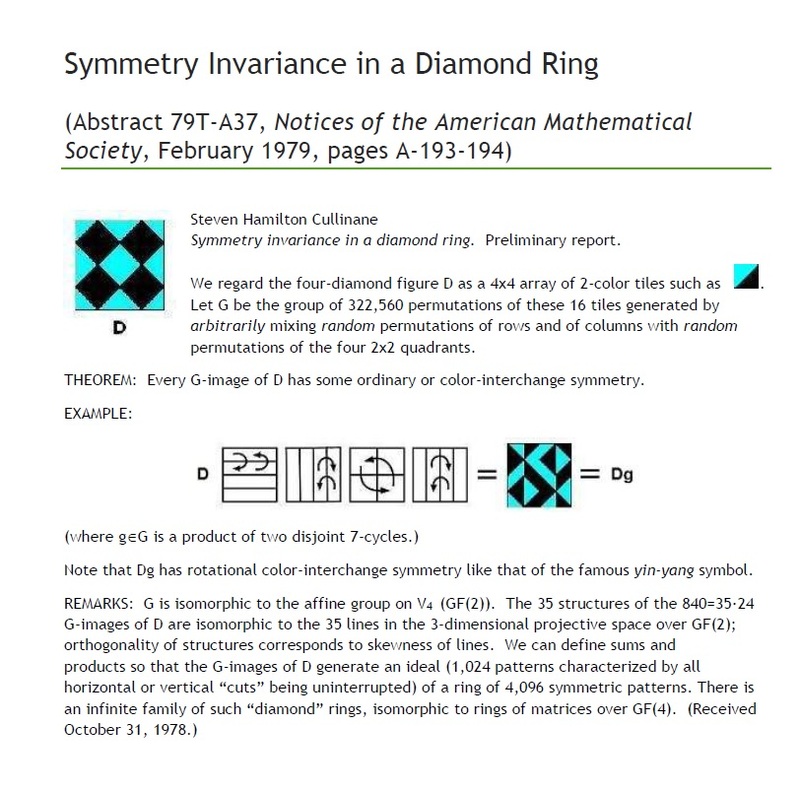 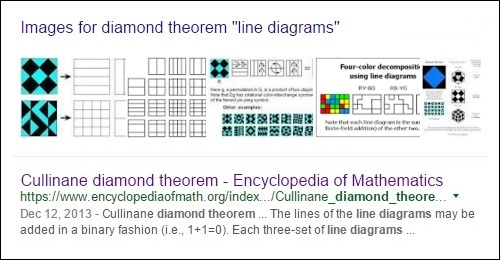 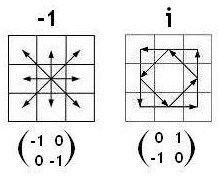 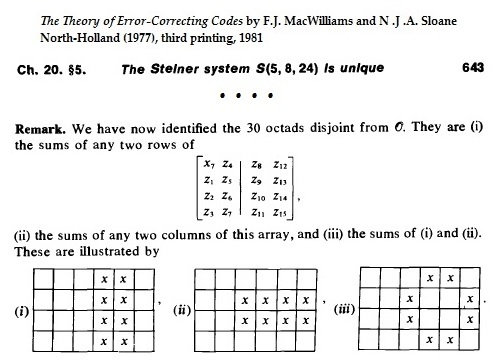 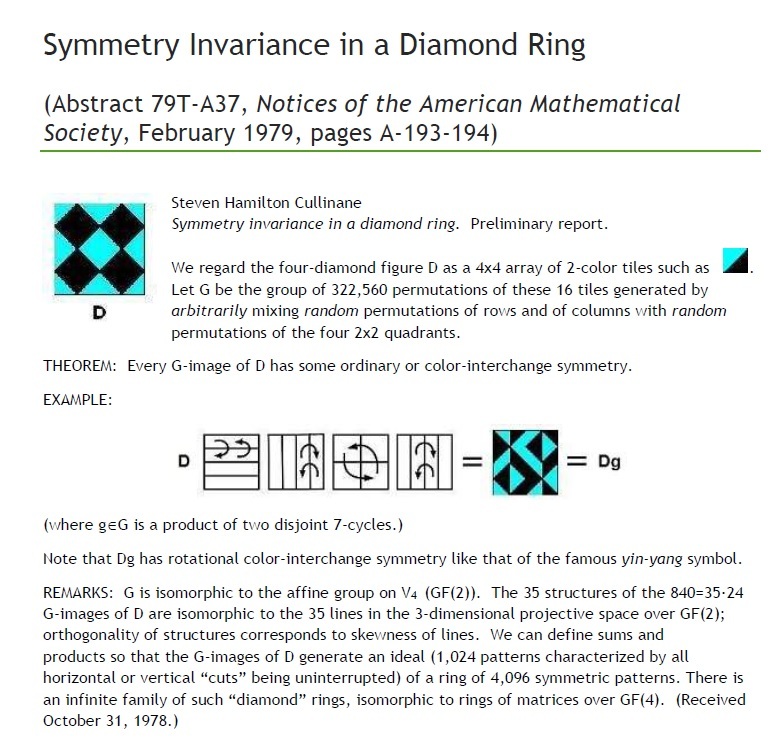 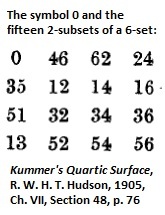 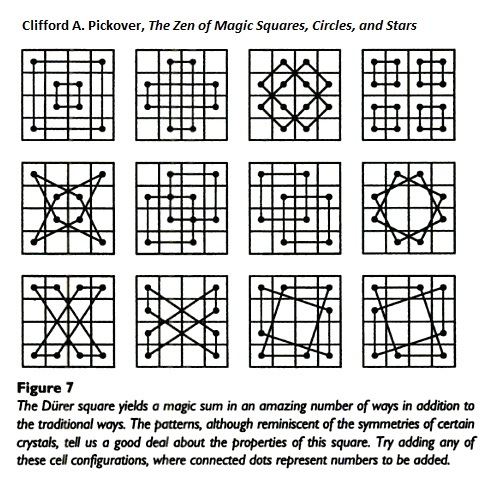 . .
Cullinane, "Symmetry invariance in a diamond ring,"
Notices of the AMS , pp. 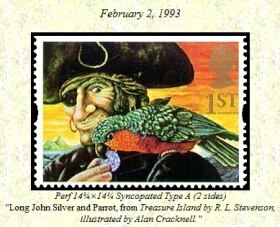 A193-194, Feb. 1979. 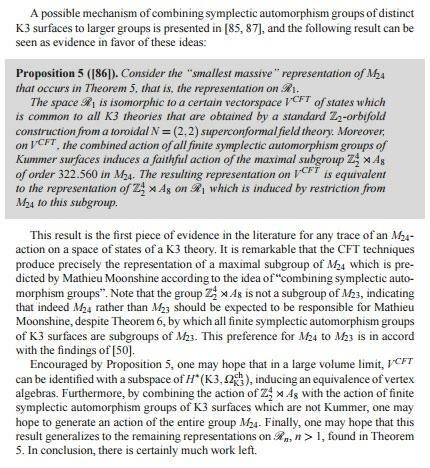 The jargon "rm OR" means "remove original research." 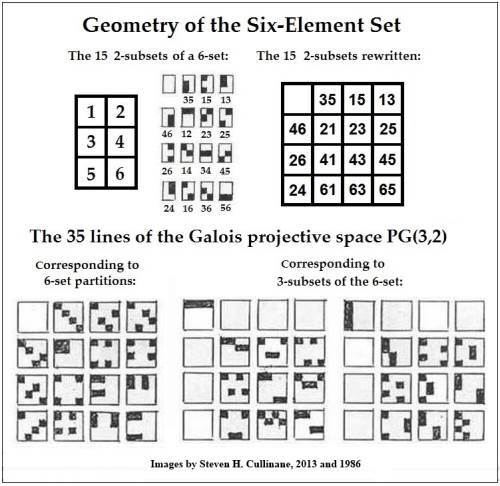 of the 35 points and lines. 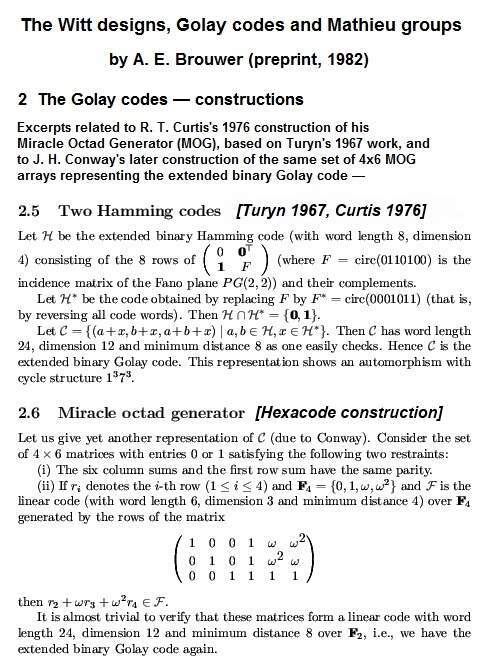 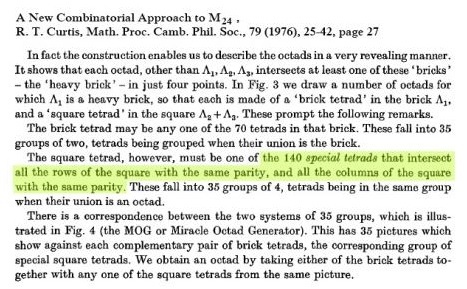 in the Miracle Octad Generator (MOG) of R. T. Curtis (published in 1976). 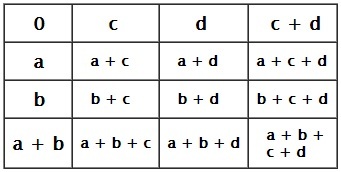 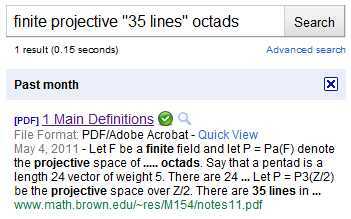 either affine (AG(4,2)) or projective (PG(3,2)). 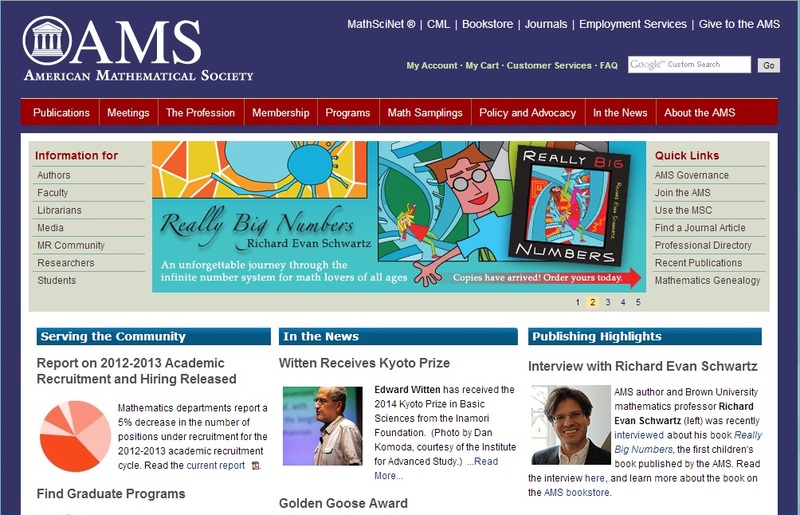 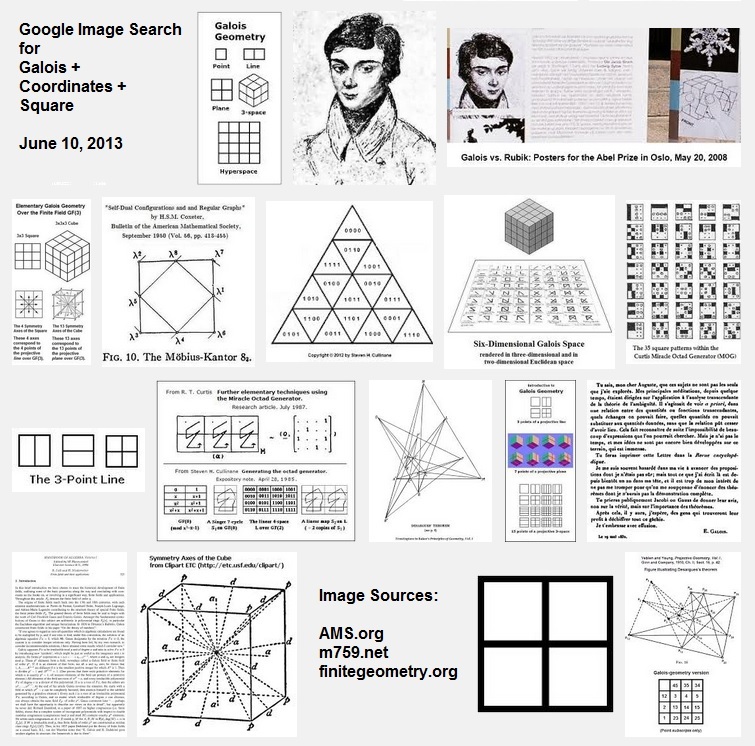 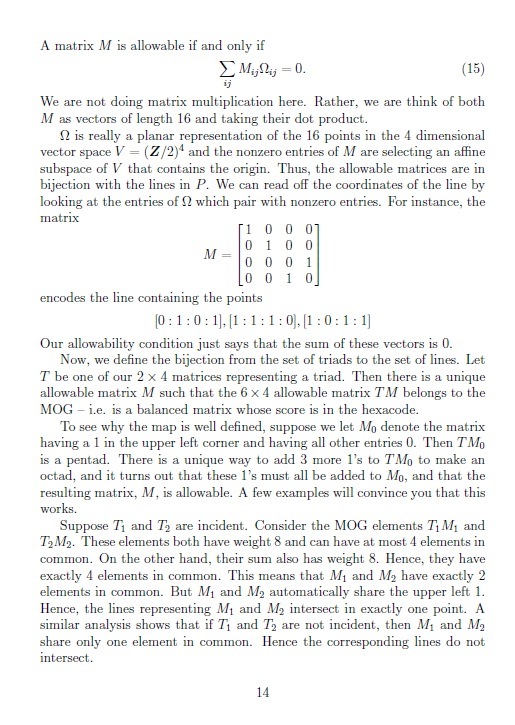 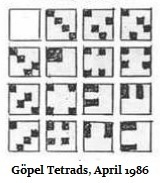 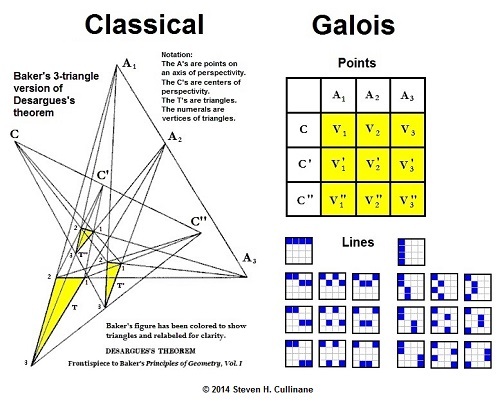 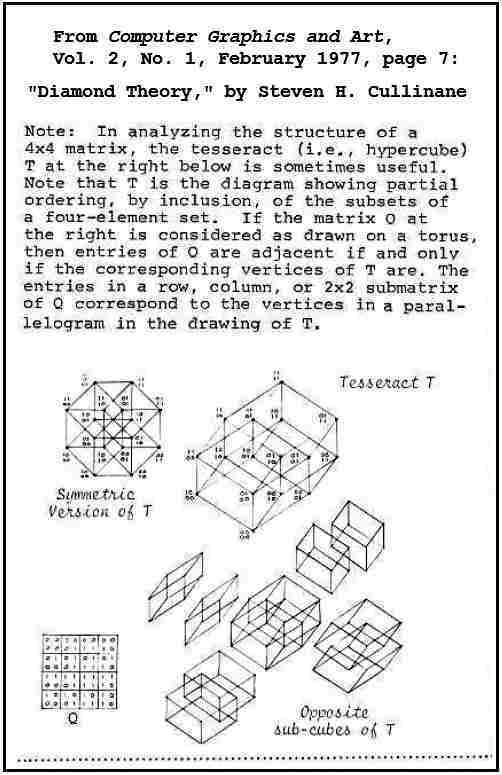 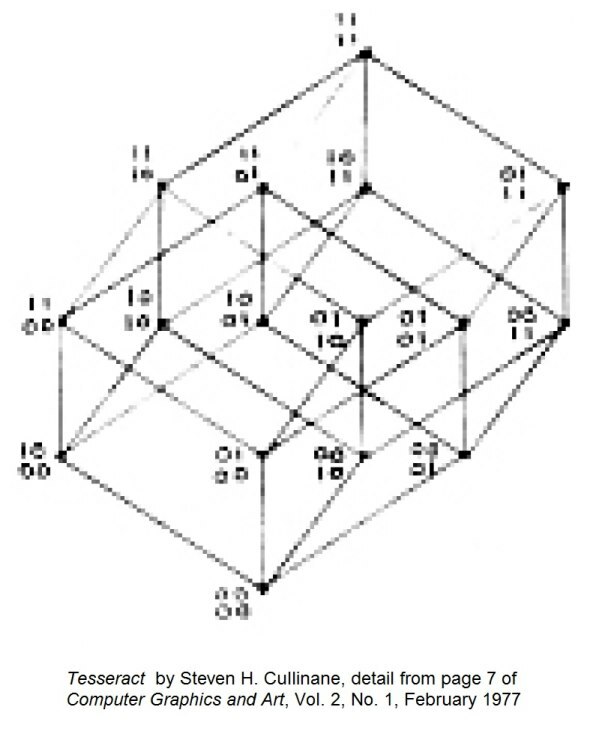 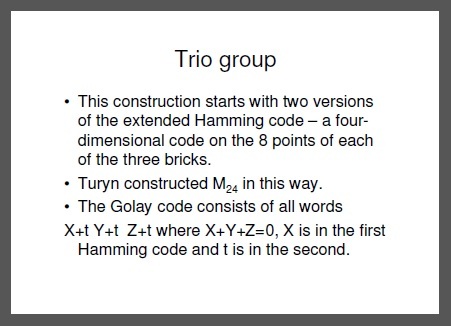 an array called in this journal a Galois tesseract. 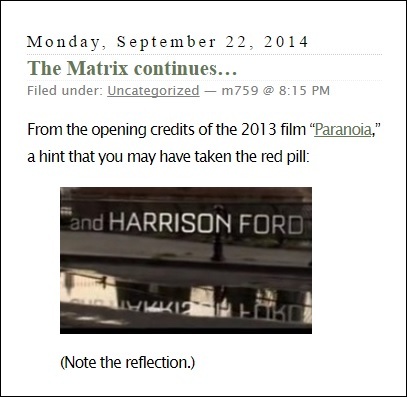 Shown below is the matrix Omega from notes of Richard Evan Schwartz. 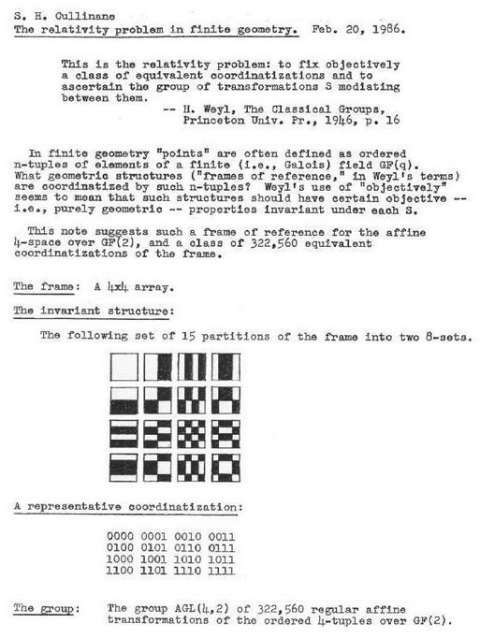 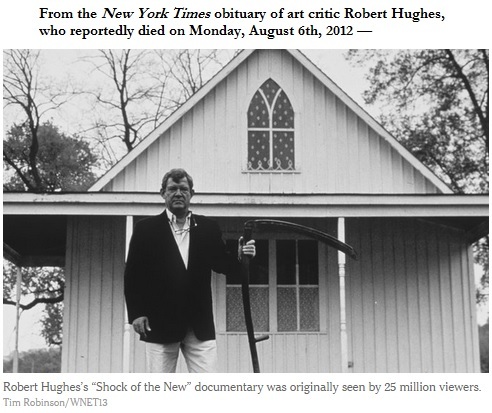 See also earlier versions (1976-1979) by Steven H. Cullinane. 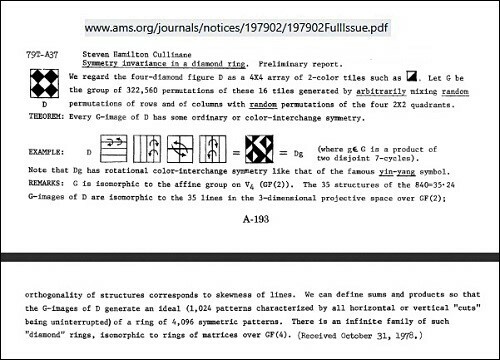 This is, of course, the same group (of order 322,560) underlying the Diamond 16 Puzzle. Recent piracy of my work as part of a London art project suggests the following. 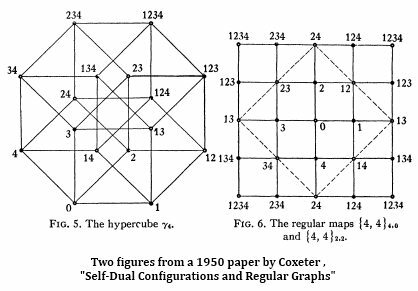 the much earlier work of philosopher Ernst Cassirer. 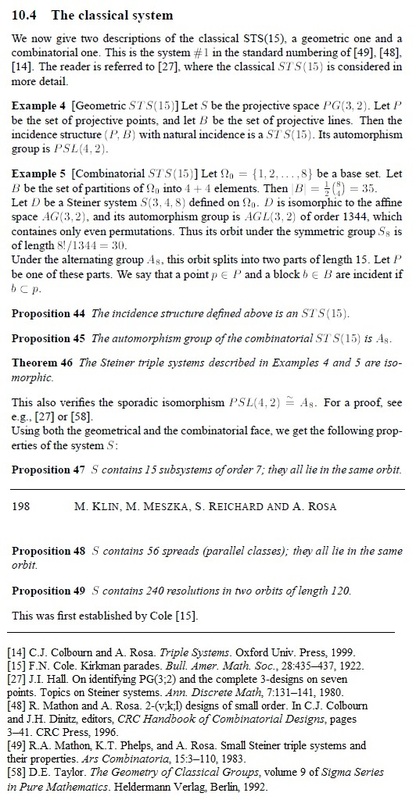 Weyl’s “relativity problem” in a finite-geometry context. 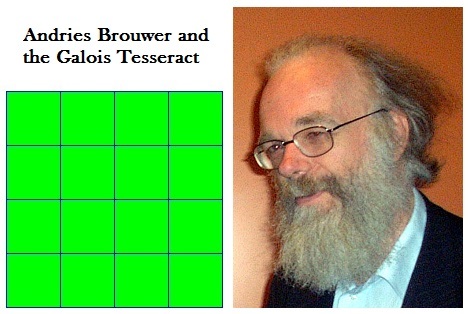 For further details, click on the above names. 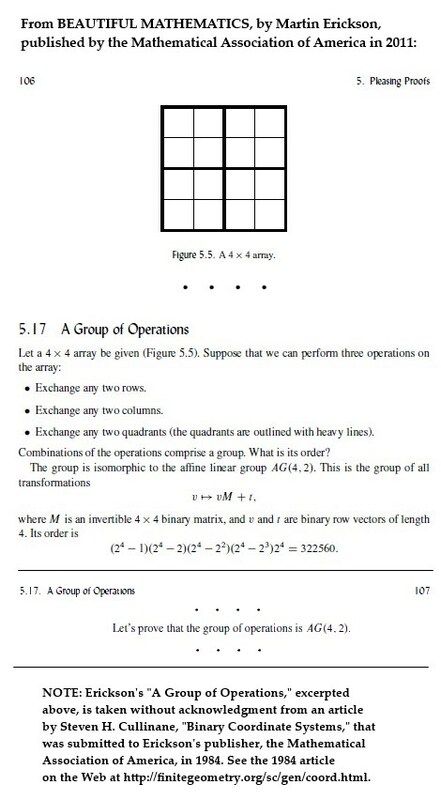 Chancellor's Professor of Mathematics at Brown University. 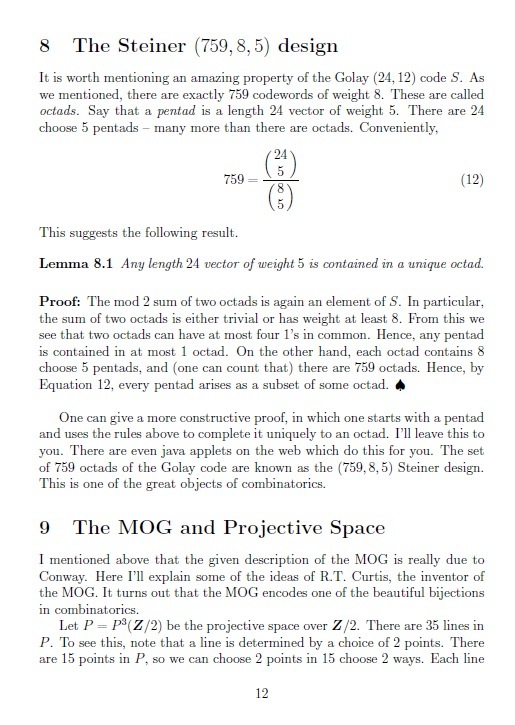 unsigned, discuss the finite-geometry background of the R.T.
the geometry to the MOG is titled "The MOG and Projective Space." 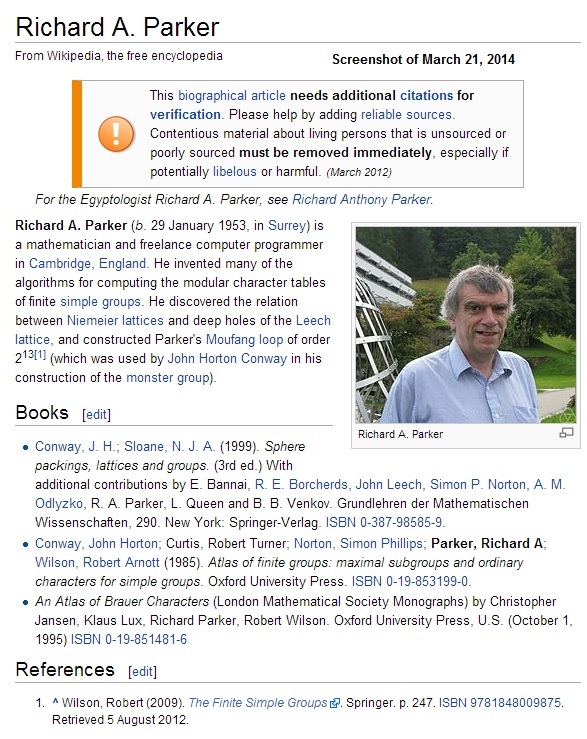 It does not mention my own work. 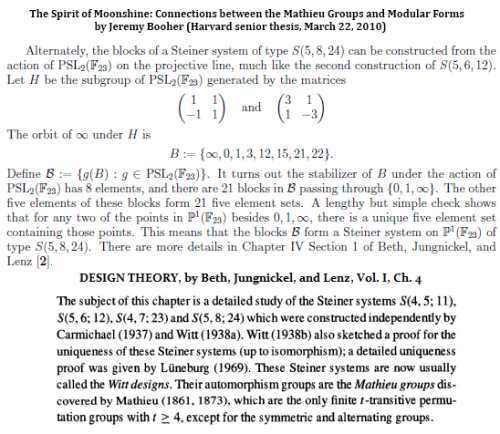 See Schwartz's page 12, page 13, and page 14. 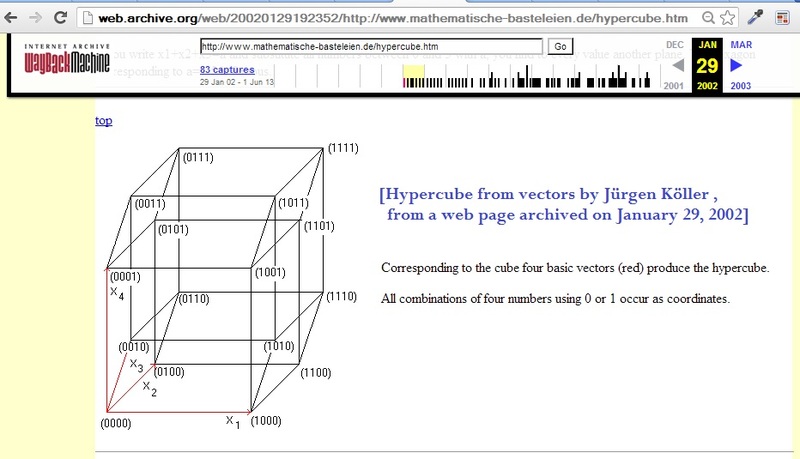 Compare to the web pages from today's earlier search. 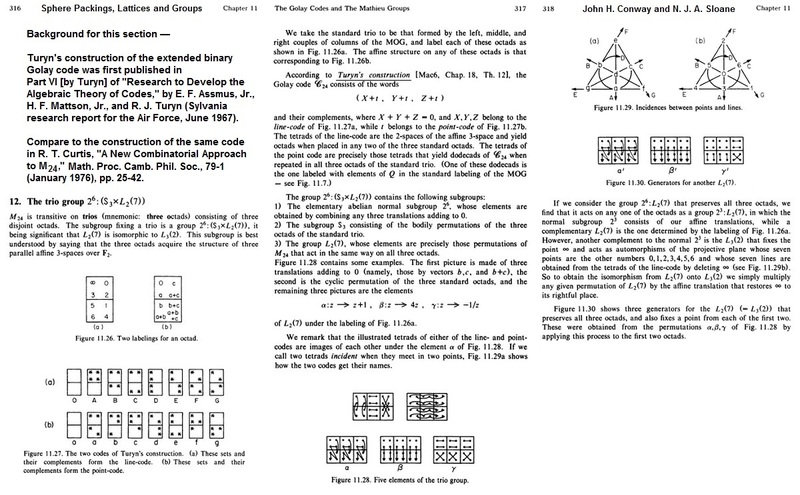 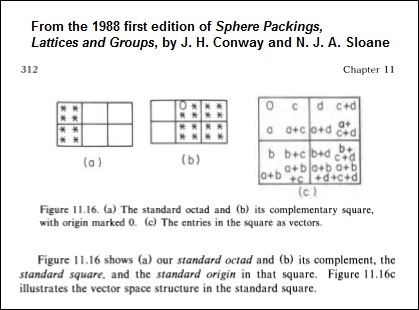 • Sphere Packings, Lattices, and Simple Groups by J. H. Conway and N.
Planet Math (on the internet) also some information. 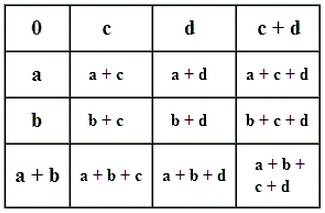 can and should be expanded.